At 22 years old, Ken Christensen wasn’t sure exactly where he wanted life to go. So he dropped out of college and traveled to Jamaica where he met an art student from Boston painting watercolor pictures. View a slideshow of Ken Christian's art studio. Christensen, who’d always had a knack for all things creative, was fascinated. When his new friend left to return home, she gave him her watercolor set. He took those and joined a cargo ship heading through the West Indies down to South America, painting each island they stopped at. The boat would dock in the morning and the view would be his subject matter for the day. OUT AND ABOUT: Los Osos based artist Ken Christensen prefers to work outside on location while painting landscapes. Christensen painted Canal St. Martin while he was traveling in France. “I’ve kind of painted every day since then,” Christensen said. While he eventually went back to college, earned a degree in history, wrote books, and dabbled in photography, painting remains his first and main love. The Michigan native migrated to the Central Coast in 1999 and settled down in Los Osos, where hundreds of large, finished oil paintings fill his garage. When clients come to look at his offerings, they’re often so overwhelmed by the selection, they have to return home to think about which of the many paintings to buy. Just like in his early days, Christensen still prefers to paint plein air, or outdoors. His bold style favors big, concrete lines and bright colors. At the upcoming PasoArts Fest, Christensen will have to cut that time in half. 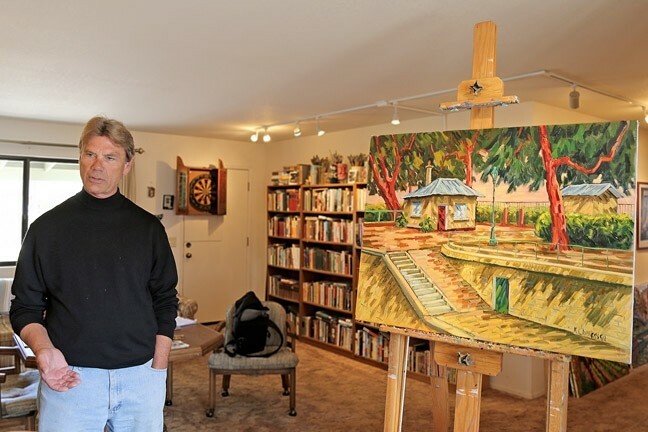 About a dozen artists, including Christensen, will participate in the Quick Draw event, taking no more than 90 minutes (in years past the limit has been a full two hours) to paint a landscape, building, or scene from downtown Paso Robles. It’s a quick draw and a quick sell. Paintings will go up for sale at the festival as soon as they’re completed. Any unsold paintings will head home with their creator. This isn’t the first rodeo for Christensen, who has participated in the event since Paso ArtsFest first began in 2009. TA-DA! 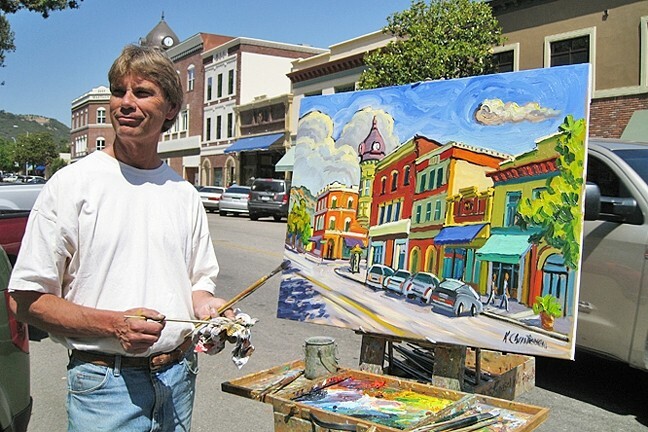 : Ken Christensen painted the historic acorn clock tower in downtown Paso Robles in 2009 during the Quick Draw event at the inaugural Paso ArtsFest. Sasha Irving, event coordinator for the festival and executive director for Studios on the Park in Paso Robles, said the quick draw event allows spectators to be a part of the creative process. Yes. Well, at least you will if you happen to be strolling around Vine Street and 12th Street on May 28, where Christensen will be setting up his easel and paints. It’s one of the artist’s favorite spots in Paso Robles. ON YOUR MARK, GET SET, PAINT! : The Quick Draw event at Paso ArtsFest will be held at 10 a.m. on Saturday, May 28, at various locations in downtown Paso Robles. Visit pasoartsfest.com for more information. To see more of Ken Christensen’s work, check out kenchristensen.net. For those looking to stay in and out of their comfort zone, the festival (which kicks off the evening of May 27 with a costume party at Studios on the Park and goes from 10 a.m. to 4 p.m. the following day in the downtown park) offers a little bit of everything from a fine arts sale to a beer and wine garden with live music to a hair and makeup contest to stilt walkers and more. Budding artists can even get hands-on by building a sand castle or getting a cool henna tattoo. Ryah Cooley only paints when she drinks at rcooley@newtimesslo.com.